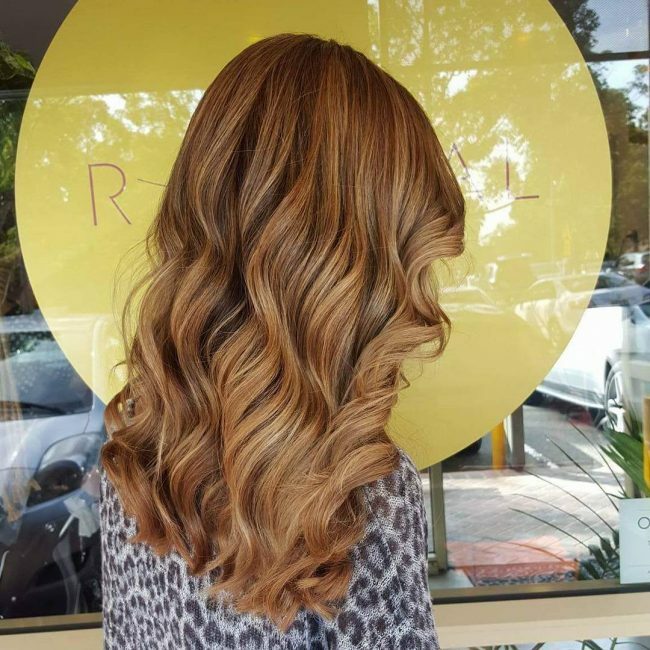 If you have no tried caramel hair color, you are missing out on one of the trendiest looks for a modern woman. 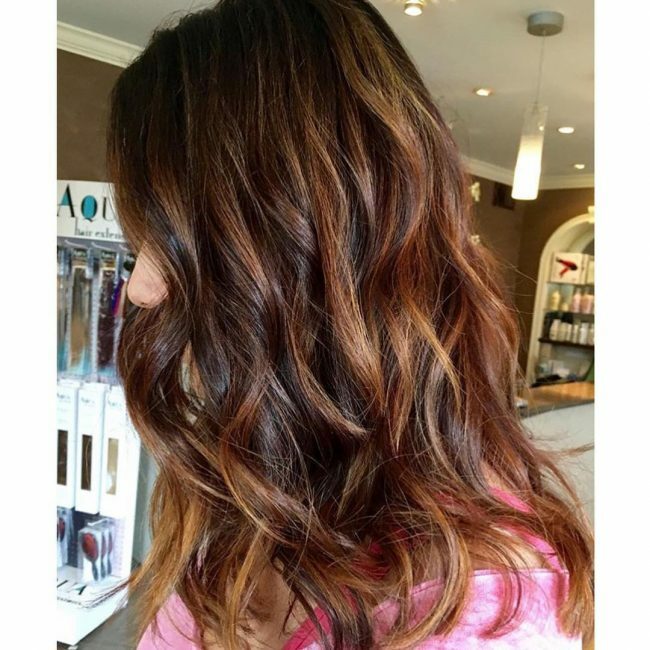 This delicious hue is incredibly enticing, and this makes it perfect for lowlights, highlights and dip dyes. Apart from this caramel comes in many shades and so you can easily find something that goes with your skin tone and personal preference. You can also combine it with other shades to create a top notch headdress, and the 60 designs below will give you some examples of how you can wear it. 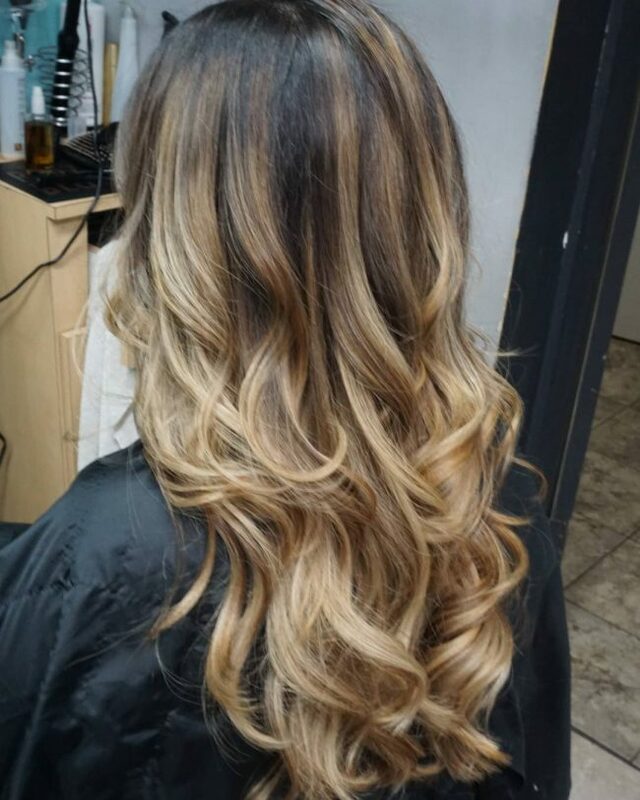 Balayage is the best way to get a natural looking headdress and in this style, it creates some lovely caramel highlights with a hint of blonde. Apart from the color the strands also have an attractive layered style and a soft center part. The free lights in this headdress are gorgeous and stunning but what makes then stand out is the color choice. 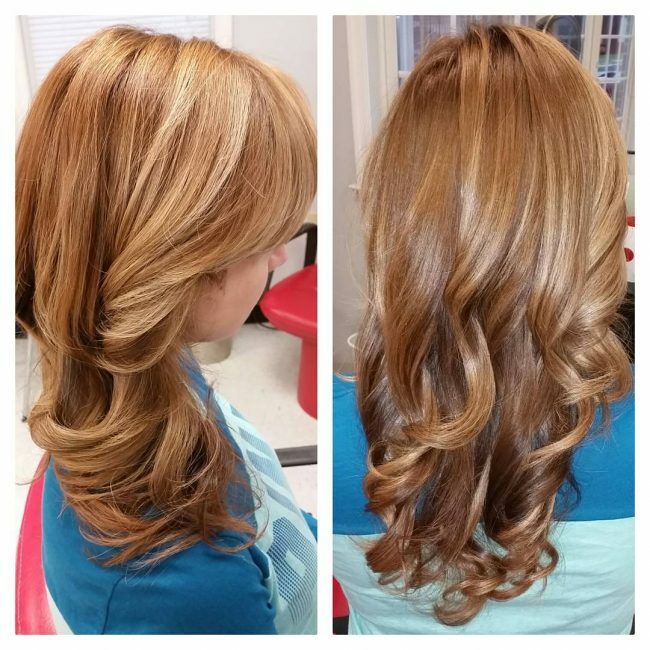 Caramel blonde highlights some natural brunette locks to create this look. It also has a lovely ombre pattern and a simple brush back style that help to enhance the overall appearance. Choosing the right shade to use on your hair is always the first step in creating an elegant design, but you still have to use a good dyeing technique. 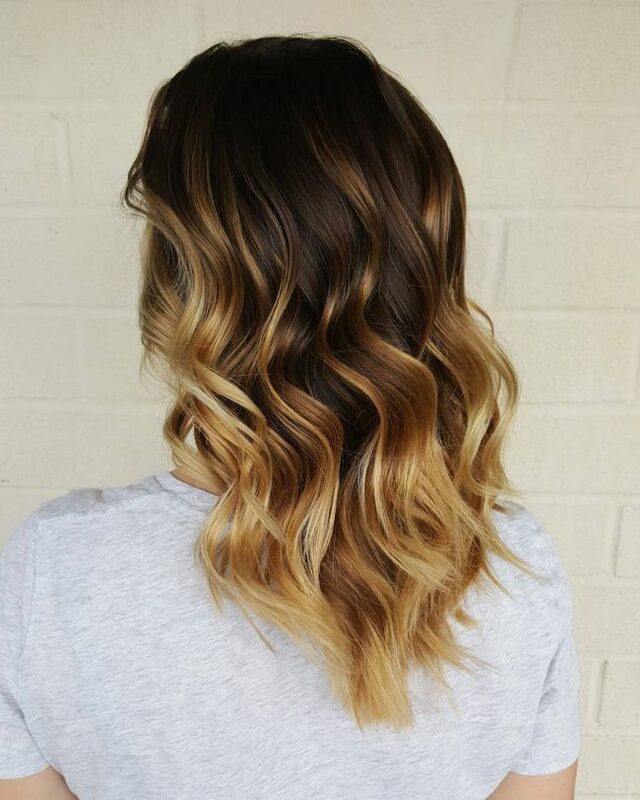 This style uses free hands painting, and a subtle shade of caramel is painted on some black locks in a Sombre pattern to create a dimensional look that you should style with a center part. Although this design has a regularly highlighted look, the colors and how they mix makes it look very distinct. 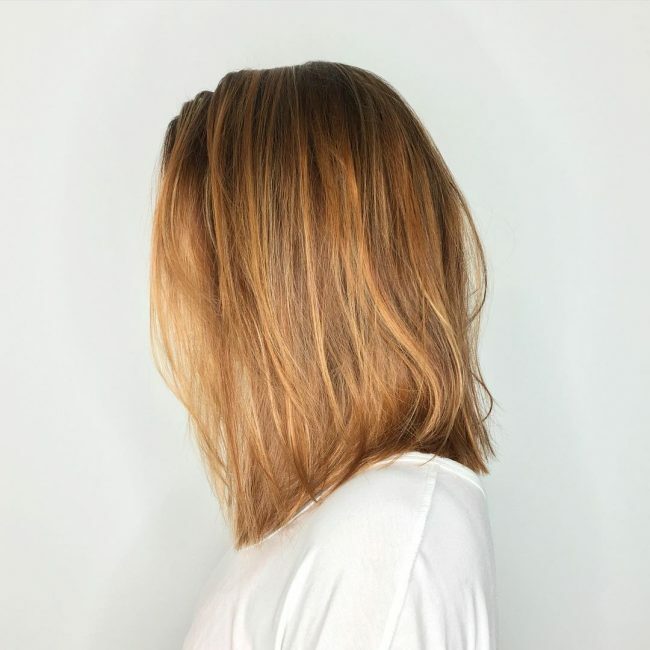 The shades are caramel and golden brown, and they blend in to give the strands a lovely tone and shine, and you should finish the look by leaving the long textured locks to flow freely to the back. 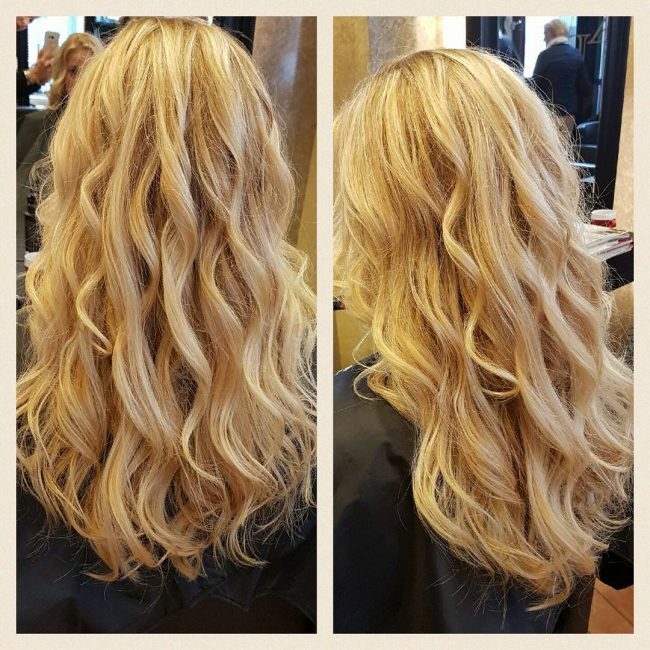 These locks have an incredible volume that comes from layering them to create a face frame. 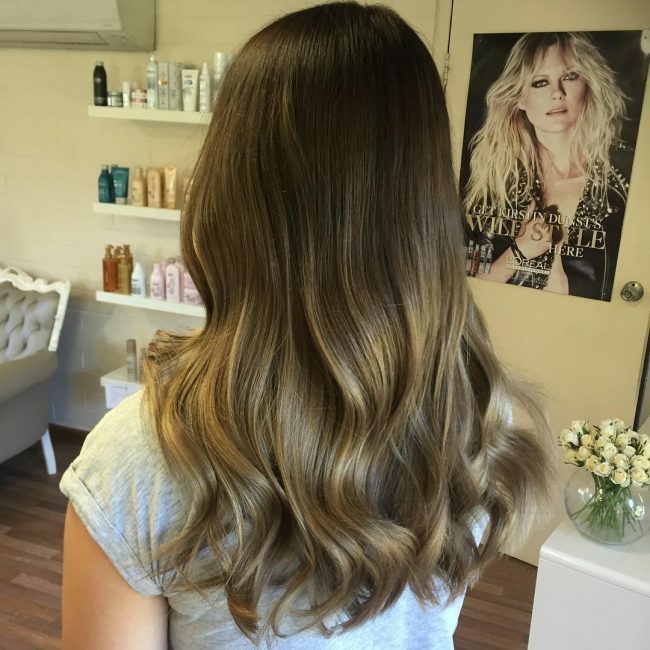 Apart from this they also have a sweet ombre design and some lovely partial light brown highlights that accentuate the look perfectly. Brown shades come in many tones, and it is not always easy to tell them apart, but this doesn't matter provided you can use them to create a refined look. In this particular design, the hues are a honey brown base and chocolate that melt to create distinct tone. 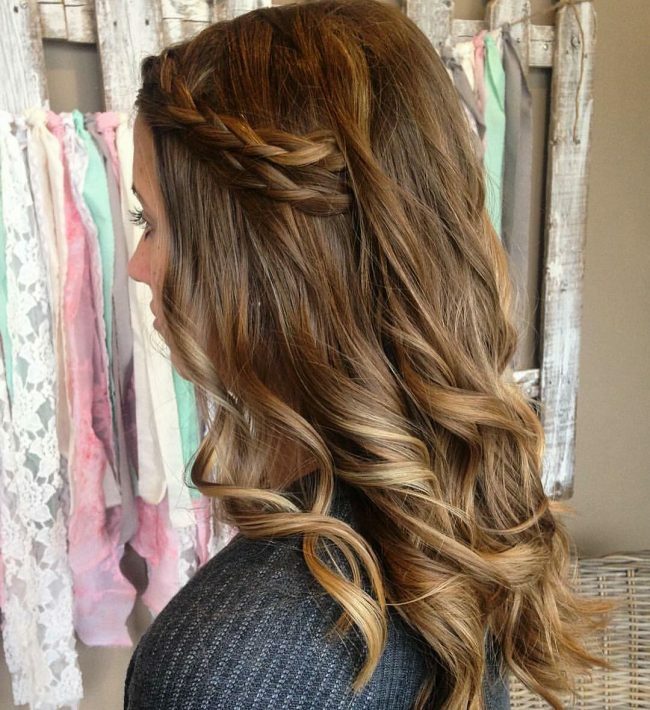 The hair has some lovely curls that you should style by stacking them to the back. 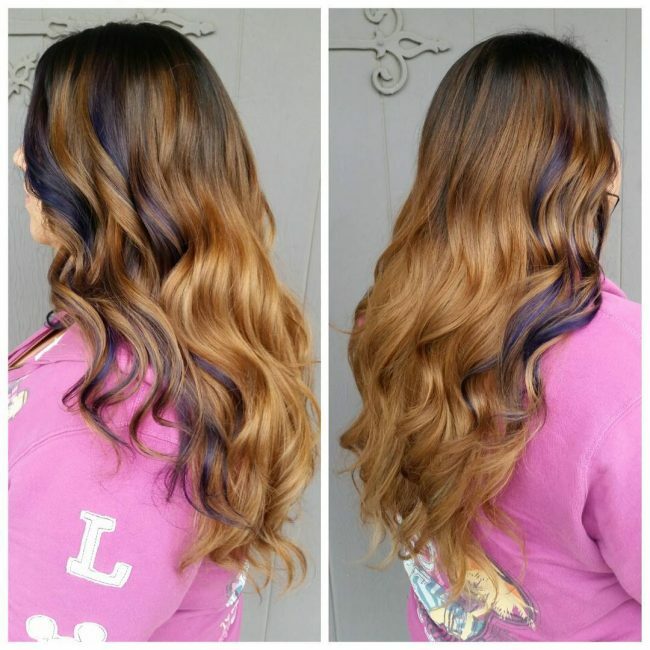 Melting in different tones to create a unique color is an inventive way to give your strands a perfect dye job. Here several shades of brown melt in with the most dominant one being the caramel. The textured strands also have a hint of blonde on the ends, and you should style by layering them for an extra volume. 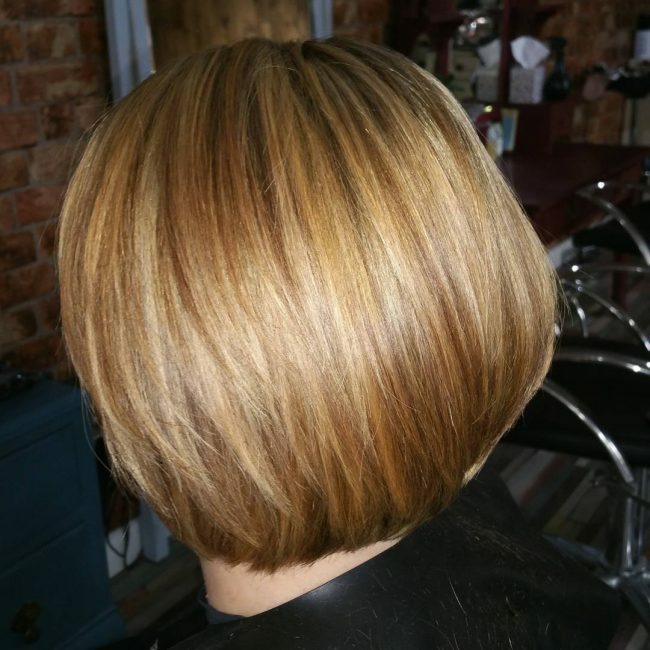 This bob haircut has a perfect cut, and it is also impeccable due to the smooth styling. The color is also top notch, and it comes from blending caramel latte into a dark brown base. Since the Bob is short, you will not need to do any fancy styling because brushing it sideways and to the back from a center part is enough. The blend of colors on these waves is what gives them their soft appearance. And it is a product of mixing caramel with light brown and blonde in a Sombre pattern to create an elegant look. The subtle shine in the style is also vital as it makes the hair look healthy. 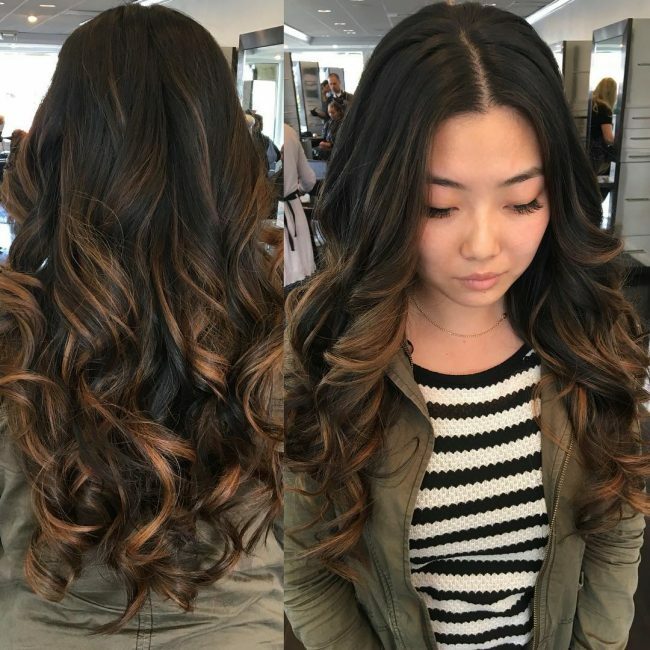 A simple twist can transform your wavy strands into an elegant design, but it cannot look this good if your hair does not have the right tone. 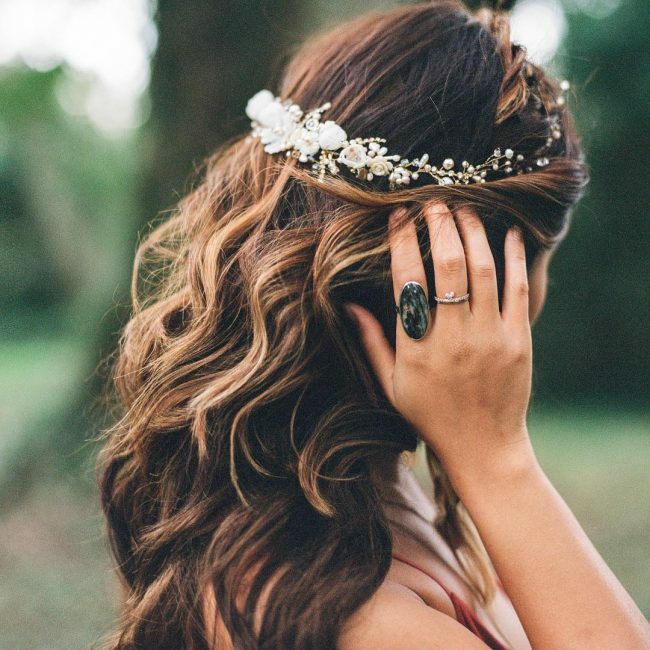 And in this headdress, the perfect shade comes from a blend of brown tones with a hint of caramel and blonde. These long locks would look good even without the color because they have a lovely texture, and the layers give them a marvelous volume. However, the ombre design that starts with a black shade and transitions drastically to a subtle caramel hue gives them some class. Blonde is the most dominant tone in this headdress, but it is on a dark base. 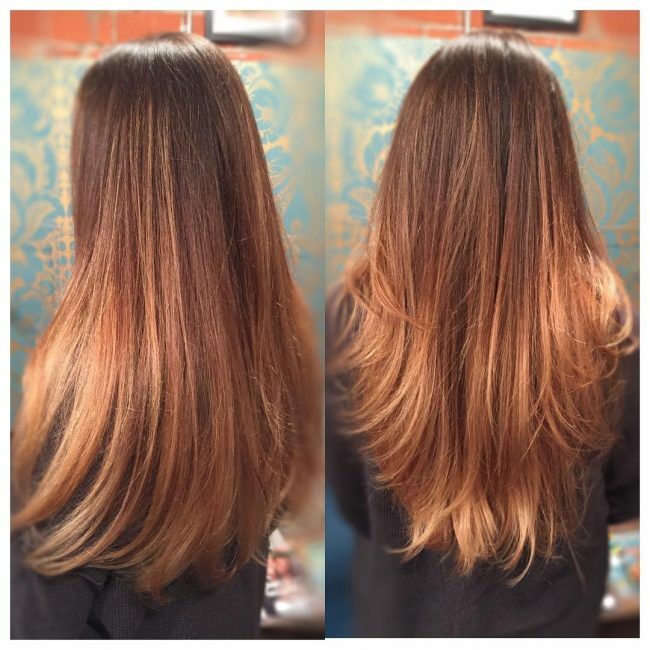 The contrast created by the two shades is amazing and makes the long textured locks look fantastic. Apart from this the style also has some moderate layers that add to the beauty. There are different shades of caramel available, and all of them can give you a fabulous look as it depends on how you use them. The caramel blonde in this design is in a Sombre pattern that is hand painted correctly. These straight locks are also very long, and this helps to show off the colors. The stylish look in this style comes from innovative dyeing since the center part is easy to make. 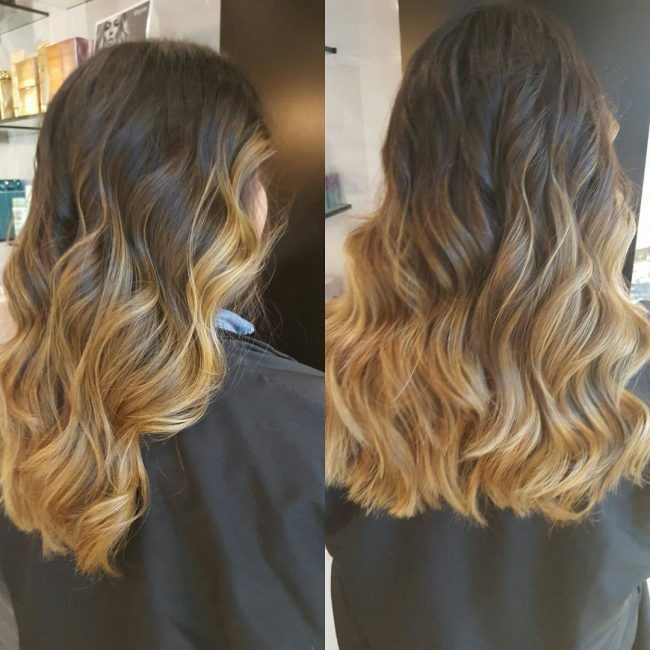 To replicate it you should create an ombre pattern starting with a dark brown base and then transition drastically to a caramel blonde hue on the lower curly half of the hair. This headdress should explain why blonde is one of the most attractive shades. 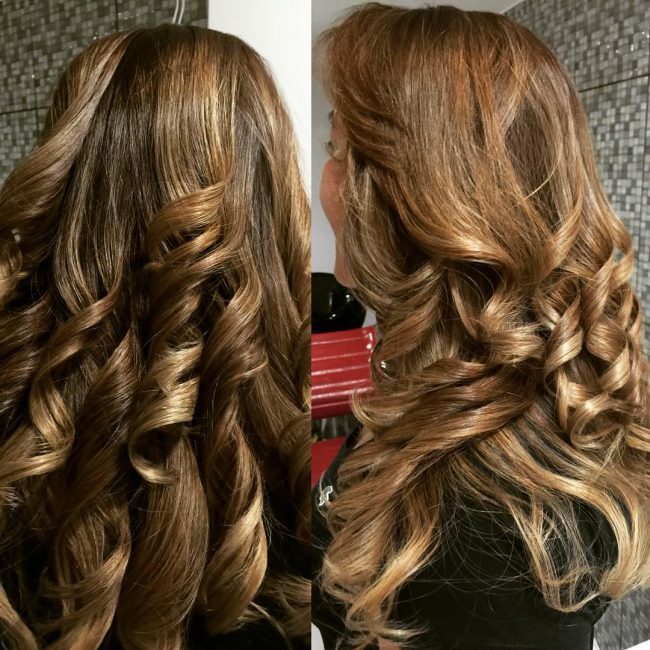 The lovely color gives the long curly locks a stunning look, and it looks fantastic when you sweep them to the back. 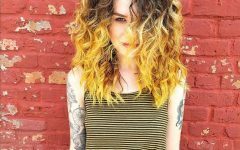 These locks also have some shadowed roots to create a slight contrast, and you should layer them for an additional volume. 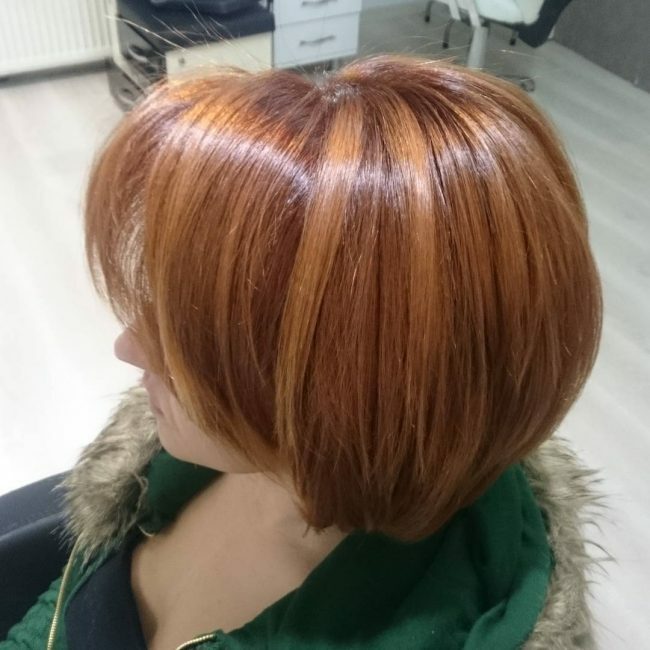 Since the cut on this Bob is very common most of its beauty comes from the dye job. It also has a subtle shine, and creative styling with a fringe but the blend of light and dark brown shade is what gives it the eye-catching look. Apart from this the hair also has some shadowed roots to create some contrast. Some ladies have long natural locks with brushed out curls like these, and so they have to do little to create an elegant headdress. If you have these locks, you only need to introduce a dark brown shade to your hair and then style them with a loose knot to finish the look. 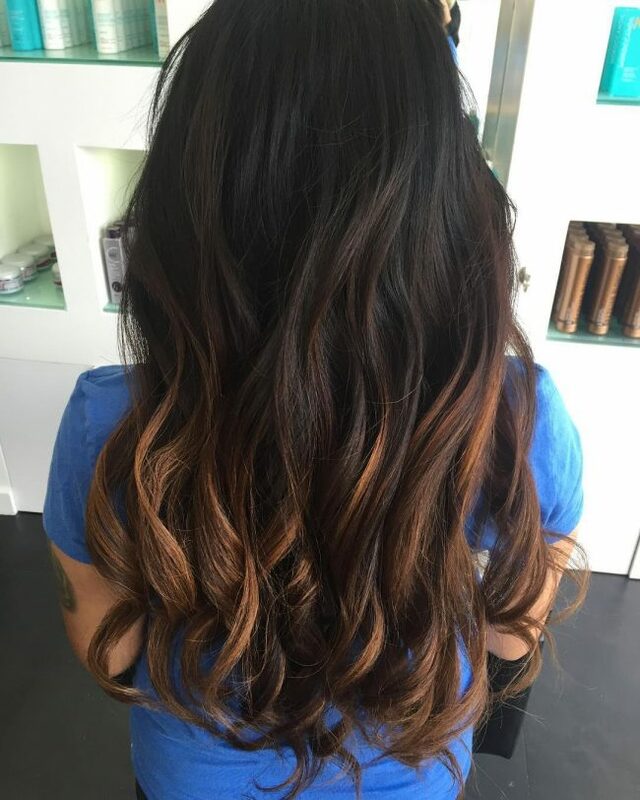 Even if you do not have long full locks that you can color to create a perfect caramel hue, you can still get the same look with some extensions. 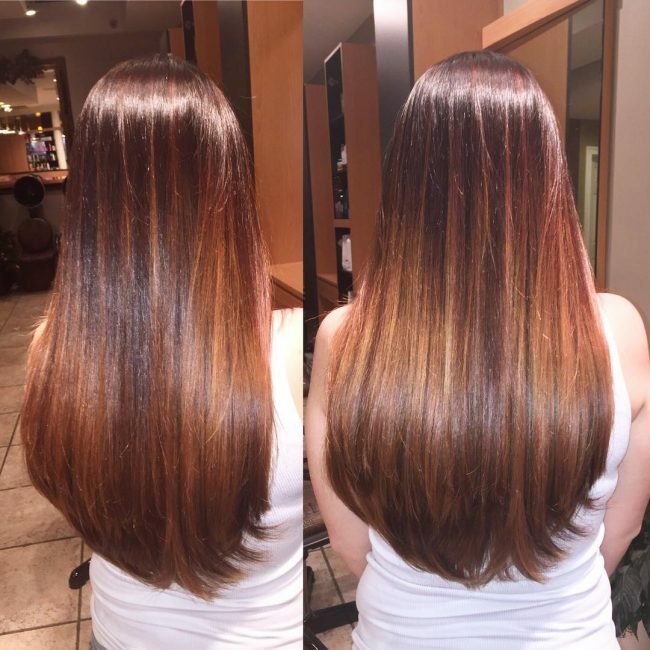 These long luscious locks are artificial extensions, but they look very natural due to their lovely dark brown and caramel color blend. 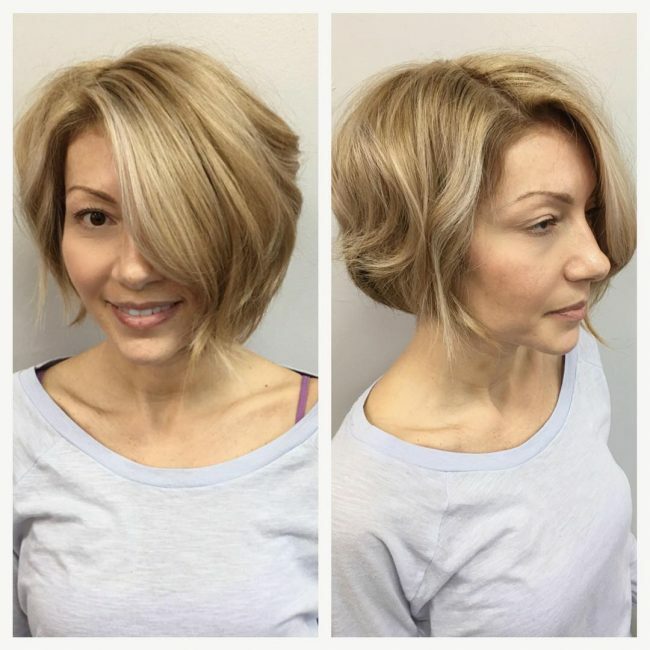 This hairdo is another example of a short bob that is cut and styled right. It starts with some trims that leave only a few inches of hairs with blunt tips. You should color the strands with a honey blonde shade and style by making the strands into a concave design. The styling of these tresses is very attractive, and it involves knitting a loose twist and layering the strands to the back. 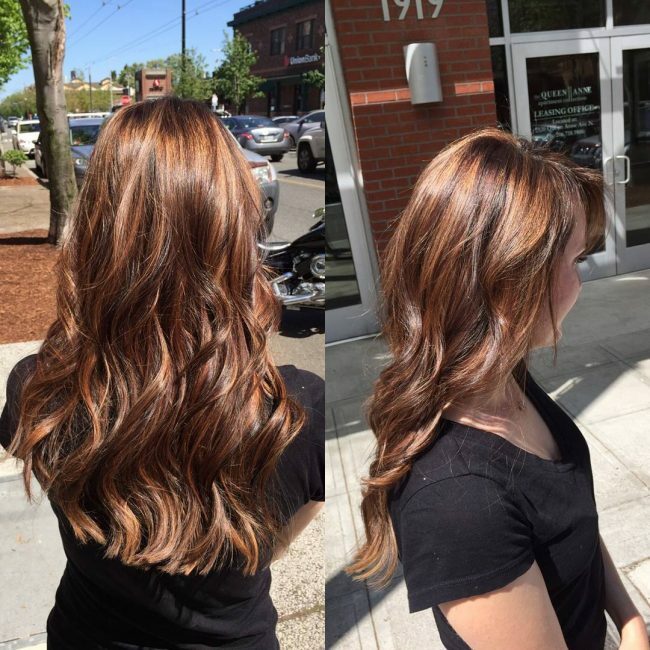 However, the color is also incredible, and it is a dark caramel brown that the wearer spices up with some beautiful pops of blonde. 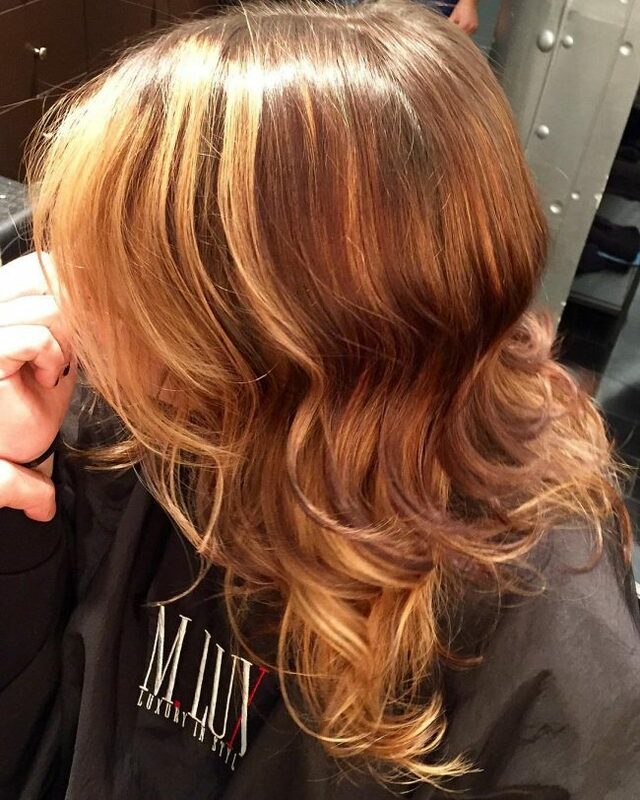 This trendy balayage design comes from transitioning from a dull natural brown hair to a lighter caramel shade. 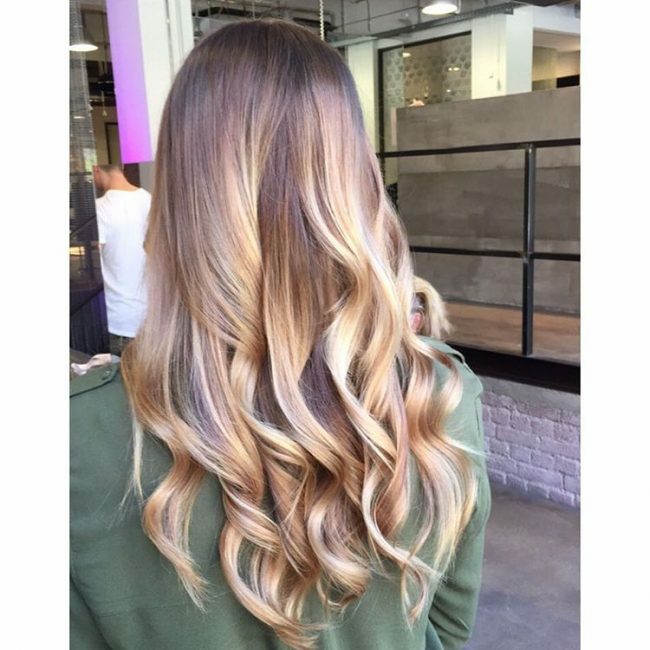 To replicate the style you should hand-paint your locks and spice them up with a hint of blonde and a subtle shine. 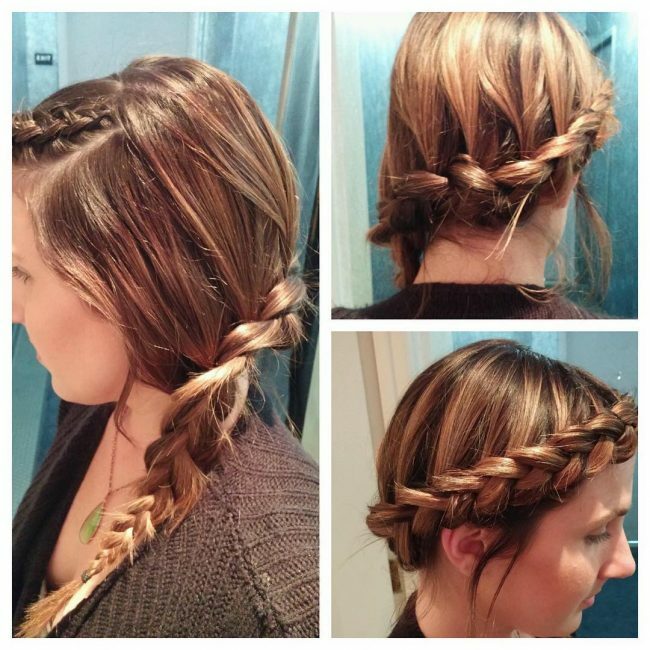 You should then finish by layering your strands to create a trendy look. 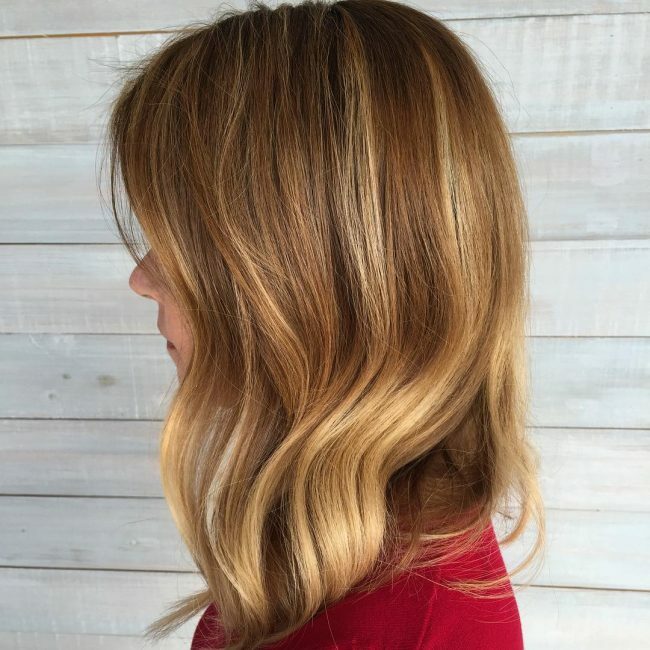 This long bob looks fabulous due to its beautiful chops, subtle waves, and the elegant color. The texture that the haircuts are easy to replicate, but the color might be a challenge for some people. However, you can achieve it by introducing blonde streaks on a chocolate base. 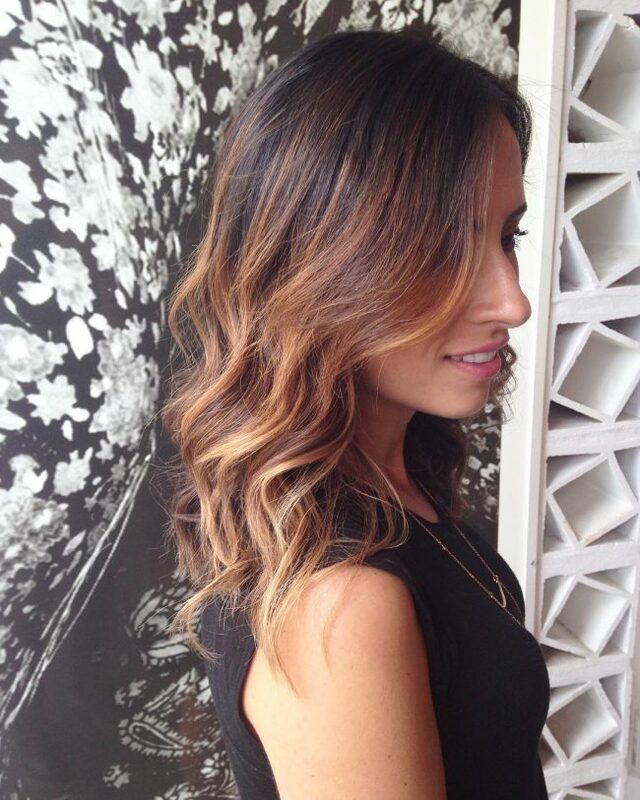 Balayage gives you the freedom to wear any color that you wish and still maintain a natural look. In this style the base color is chocolate brown and although it is a dull shade the introduction of a hand-painted golden tone breathes some life into it and also gives it an incredible shine. You should then finish the style with a simple face frame and by leaving your locks to flow freely. 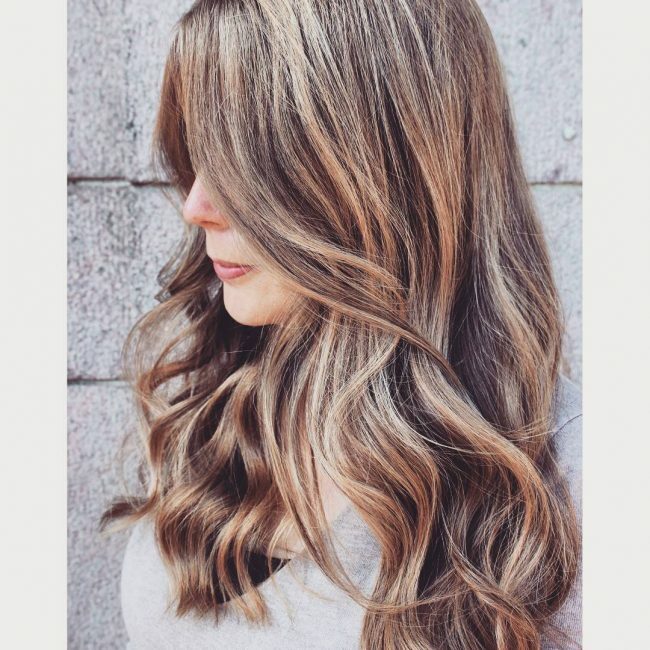 Brunette strands are naturally very attractive, and this makes work easy for you because you only need to choose a good shade such as caramel blonde to create a distinct look. 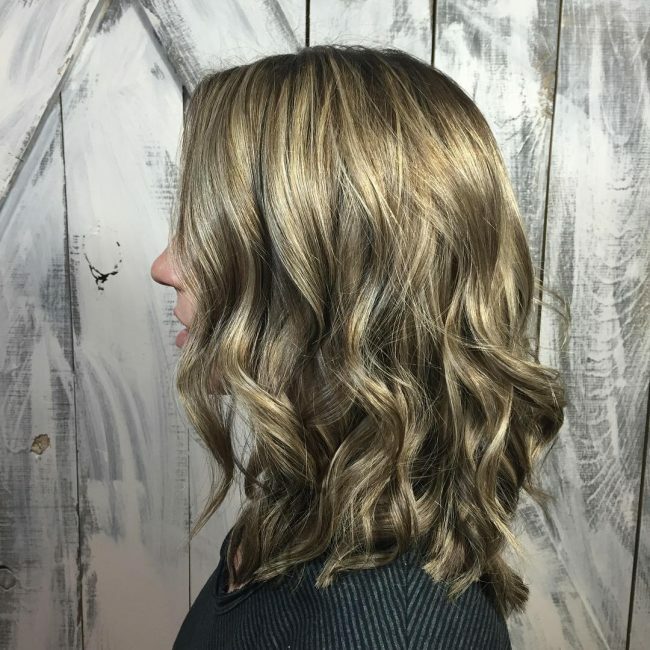 The perfectly done highlights are critical in creating this look, and if you also have some beautiful brushed out curls, you will look outstanding. The smoothness of this blowout is very impressive, and the layered styling helps to add some detail to the look. However, the hand painted chocolate and honey tones are what make this headdress stand out. The root touch up is also fabulous, and it helps to create a slight contrast in the design. This carefree hairdo is perfect for the outdoors and it is also a very simple design to create for ladies with medium and long locks. To wear this look, you should have some shadowed roots or a black base and then transition it to a blend of caramel and blonde in an ombre pattern. You should then style it with some soft waves to create the beach look. The softness that a Sombre color design creates is fascinating, and you will want to keep your hues for long. 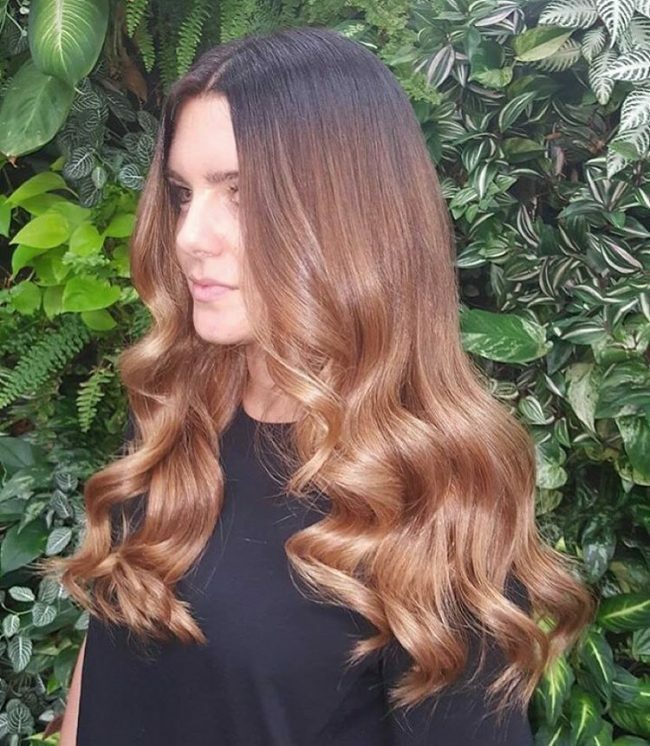 In this design, the long locks have a seamless blend of caramel and blonde and the two shades create a smooth transition from the darker base to lighter ends. 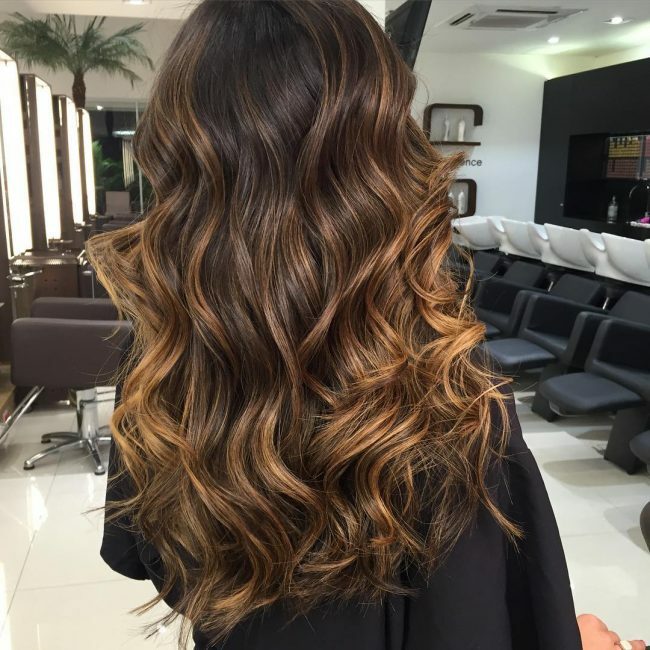 These locks also have some moderate waves on the ends that help to enhance the overall appearance. 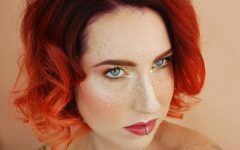 Although the hairs on this style are short and thin, they still manage to create an elegant hairdo, and this is thanks to their color and styling. The color is a blend of light brown and blonde and you should style the hair by stacking them innovatively over the forehead. Brazilian hairdos are magnificent, and they never seem to go out of trend. This particular one is a blowout with a perfect texture, volume and cut but the tone and the pattern is what makes it a top notch headdress. The lovely shade is a blend of different hues of brown and blonde in an ombre pattern with the dark ones forming the base. This headdress also has a neat styling that involves creating a soft part at the front and then styling your locks with a side sweep and brush back. This headdress is perfect in all aspect, but the fact that the natural locks also have an excellent volume also helps to enhance the look. 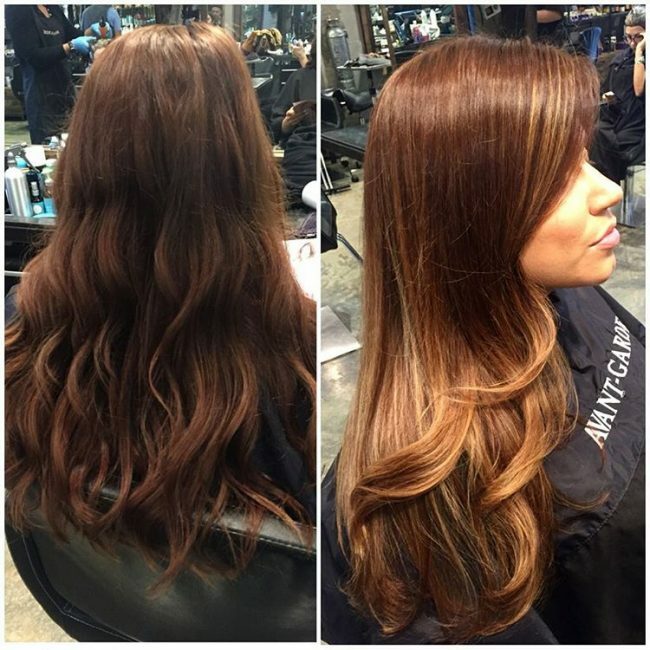 The colors start with shadowed roots and then the shade transitions to a spicy blend of caramel and dark brown. For styling, you should create a center part line that exposes your darkened roots and then side-sweep the strands to have a face frame. Rose gold is a lovely hue, but this one is exceptional as it looks more attractive than most others. Its dazzling look is one of the things that make it a fabulous headdress, but it is not the only thing. The strands also have lovely curls on the ends, but the color combination is what steals the show. And it involves combining rose gold with a blonde hue on a caramel base to create an elegant and modern shade. Some ladies think that a short hair will limit you on the designs that you can create, but this could not be further from the truth. Although the locks in this style are short, their color and styling make them look incredible. The shades in the style are copper and black, and they create a fabulous tone that you should enhance by layering your bangs. This design is very simple, but its color and texture make it look very fashionable. 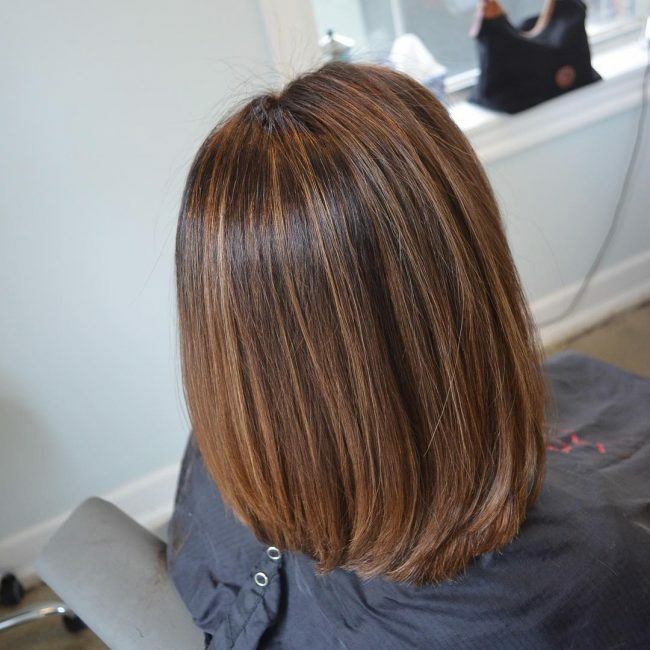 The cut involves chopping the strands to give them some texture and uniformity and the color is a melt of caramel into a dark shade of brown to create a perfect tone. You cannot achieve a unique look without breaking away from the norm, and this headdress proves this. 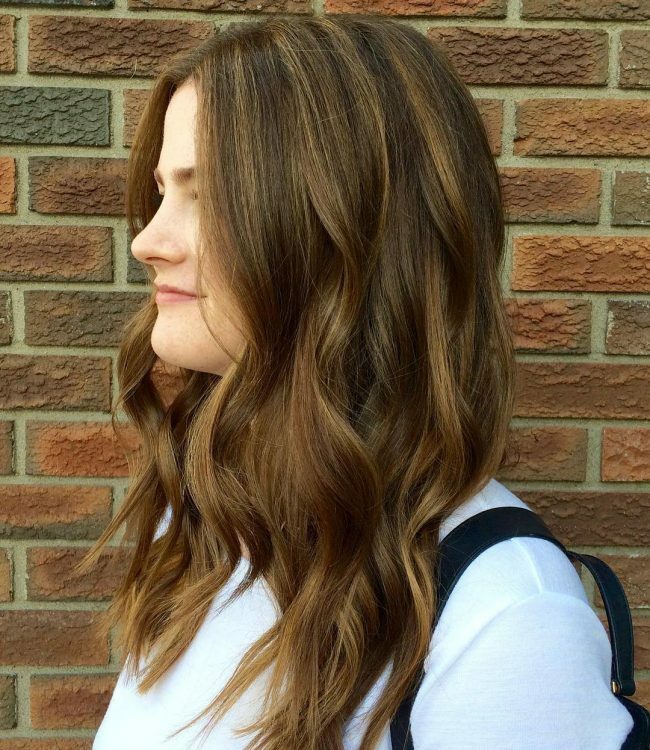 It uses typical shades of blonde and light brown but what makes it unique is the icy caramel hint. The texture of the locks and the smooth waves also spice up the look. Dimensional hair is lovely, but if you want yours to look classy, you should go with a chocolate hue like in this design. The strands in this style also have an incredible shine and a perfect color melt of chocolate and a subtle caramel tone. To style the A-line bob, you should part it on the side and stack the strands in opposite directions. 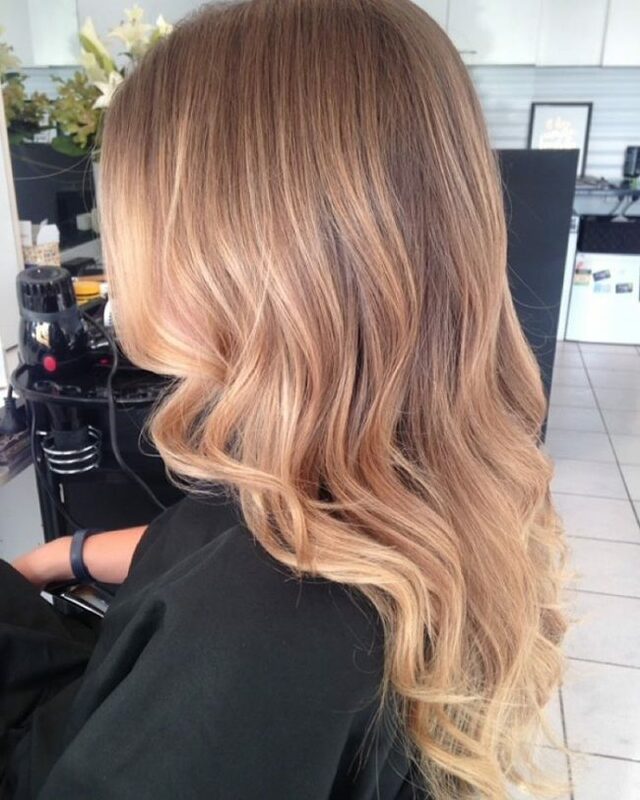 Combining brown and blonde is a good way to create a moderate shade that is also very fashionable. In this design, the two hues combine in a Sombre pattern to make the shoulder length waves look very stylish. And you will only need to brush them back to finish the design. 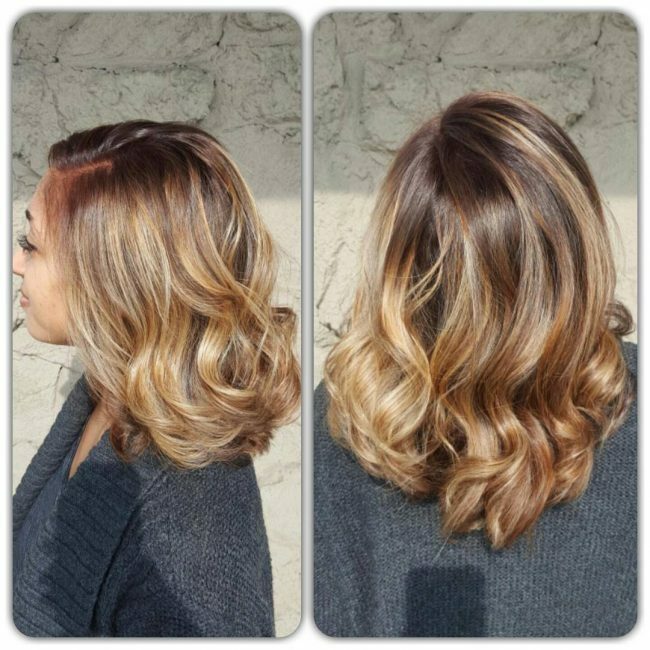 The bright caramel blonde hue is the base color in this design, and it has some dark brown lowlights that give the hair some extra depth. Although the colors are magnificent, the strands also have an incredible volume and some waves that are also vital in making the wearer as attractive as she is. Straight and smooth locks will give you a large surface area to for your colors and so the strand will always look more detailed than curly or wavy locks. However, you still have to wear some lovely shades if you want to create an outstanding appearance. This design combines dark brown and chocolate to create the top-notch tone, and you should style the strands by brushing back. The dark purple hue is the most outstanding element in this design since the rest of the hairs have a typical caramel shade in an ombre design. They are also very simple to create if you have thick strands like these as you only need to dye them randomly to create a partially highlighted look. The brown shade is the most dominant in this headdress, but the style would not look this fabulous without the hint of caramel. 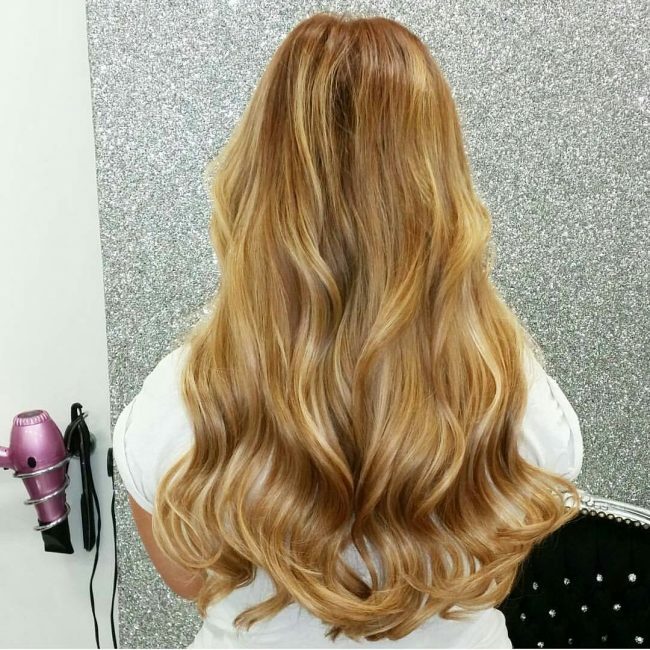 Apart from its elegant shades it also has some beautiful loose waves that you should style with a twist and by leaving the locks to flow loosely. Several things may define a hairdo, but this one is all about the incredible shine and the blend of colors. The shine of the hair is easy to achieve with a spray, but the mix of shades only comes from a keen mixture of honey brown and caramel. If you do not chop your locks well, you should not expect your colors to look lovely. This design gets both right, and this is why it looks very refined and trendy. The strands have a dark brown shade and some winning caramel streaks. These locks also have a lovely texture, and you should style them with a brush back or by leaving them to flow freely. Some shades will always blend in perfectly, and so they are perfect when you want to create a flawless design. 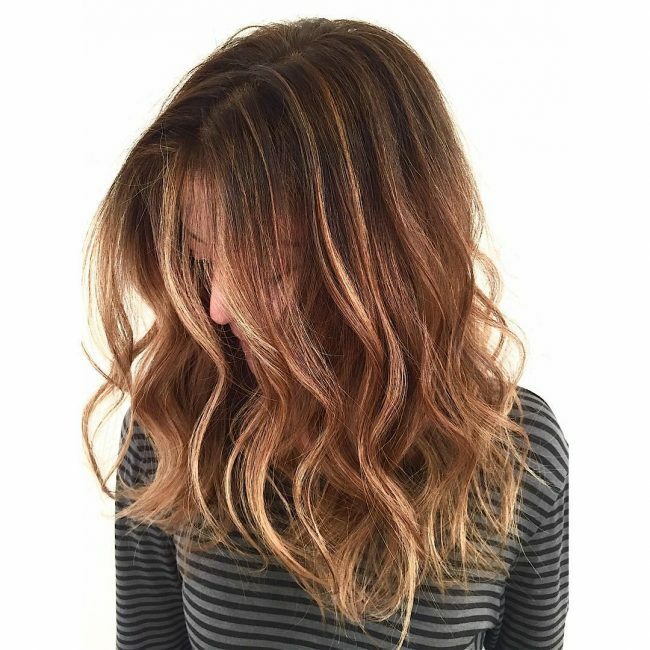 In this style, the light brown and caramel hues melt in perfectly to give the wavy locks a top notch look that you can spice up by pushing them back. 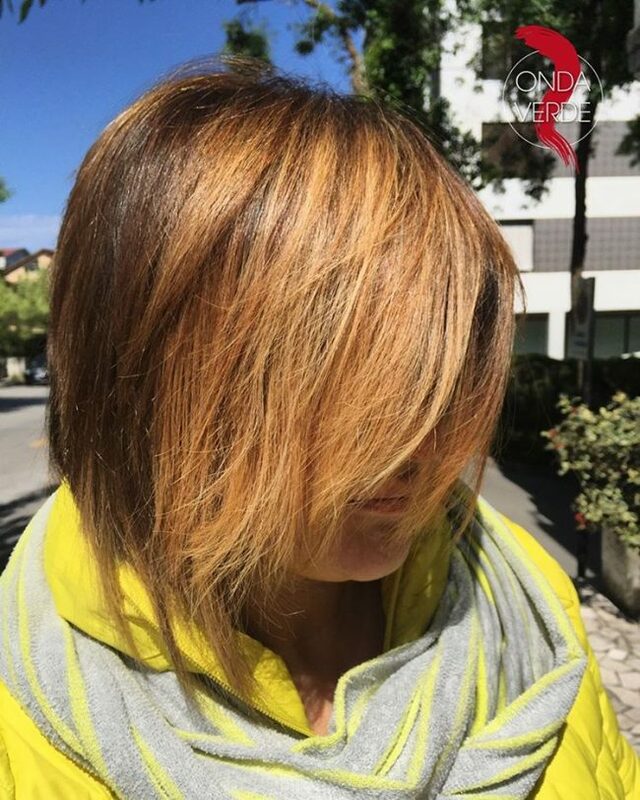 It is amazing how you can use some color to spice up an ordinary short bob. 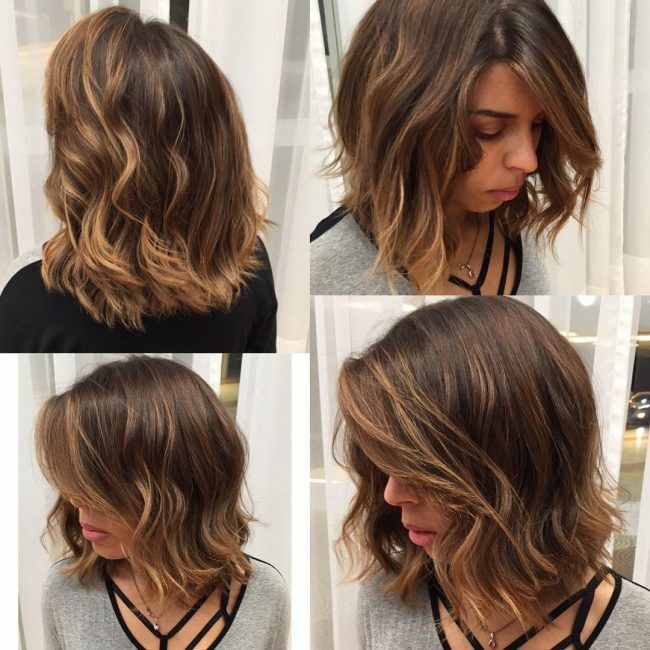 This bouncy bob looks stunning, and this is due to the blend of blonde and brown hues. The style is also fabulous, and it involves parting the short strands at the center and styling with a diagonal face frame. Everything about these luscious waves is perfect, and it’s hard to see anything about them that is not perfect. Their length is fantastic, and they have some lovely brushed out curls that make then look trendy. The color is also top notch, and it is a bright caramel with a hint of strawberry. 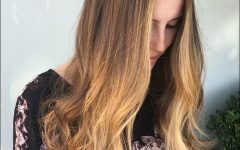 You do not have to go with the ordinary transition from a dark to dazzling shade to create an ombre look since there are still other ways you can achieve it. 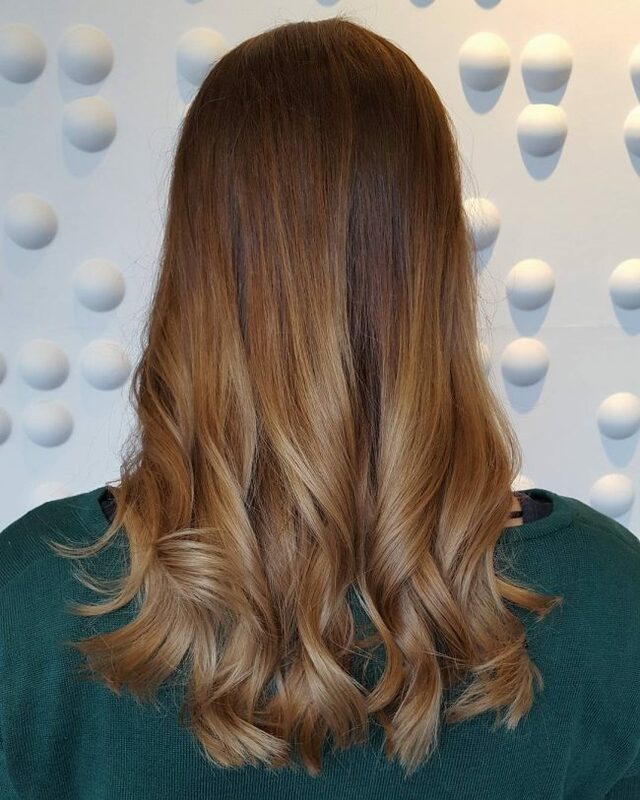 In this design, the ombre look comes from transitioning drastically from a blend of brown and blonde to a bright blonde hue. This transition still manages to create the lovely ombre contrast. 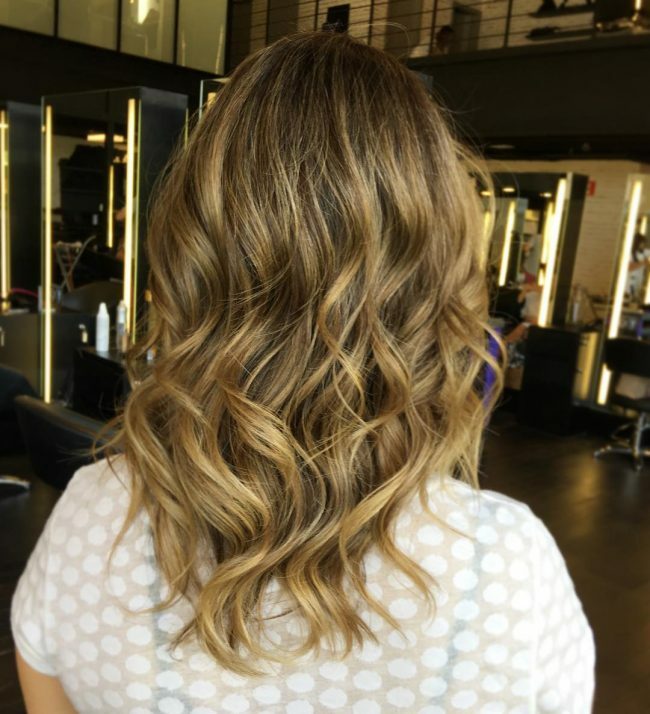 You have to try out balayage if you want to keep up with the trend, and the beauty of a style like this one should convince you. The cascading design is fantastic, and the long textured locks also have an incredible caramel shade that looks very natural because the strands are free hands painted. The warmth and depth in these thick luscious locks are enticing, and no woman can say no to this look. It is a product of excellent color choice as different shades of brown combine to create an eye-catching shade whose appearance you can enhance with a center part and by sweeping the strands to the sides. 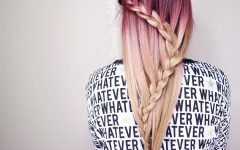 Layering your locks is not only a way to make them look voluminous since it still gives you a very stylish appearance. 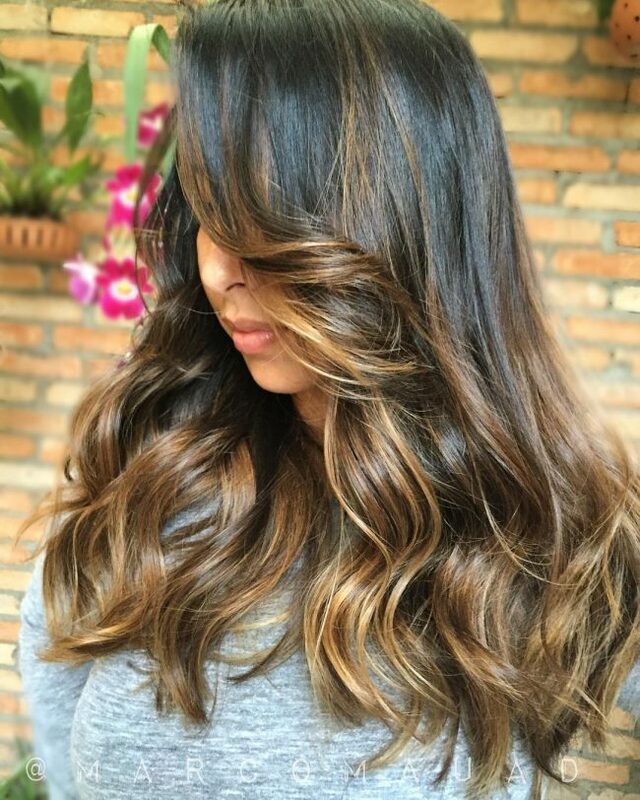 In this style, the long layers also have a top notch Sombre shade that involves transitioning from a dark brown base to caramel on the ends. The smoothness of the long locks and their simple center part at the front also help to enhance the appearance. 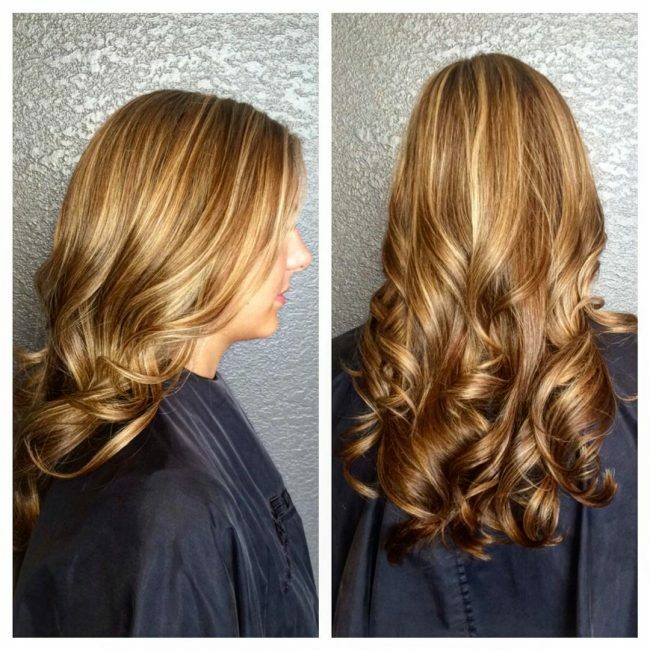 If you introduce blonde or golden highlights to your brown strands, they illuminate and give you this fantastic look. If you have loose curls like these and style by brushing back, you will be able to show of this illumination and hence make your headdress very trendy. You can also style the locks with a center part or a face frame as this depends on your personal preferences. Long locks are very addictive, and once you get used to them, you can never wish to cut them short. However, you should also style them right with some subtle shades such as the dark brown hue on these. 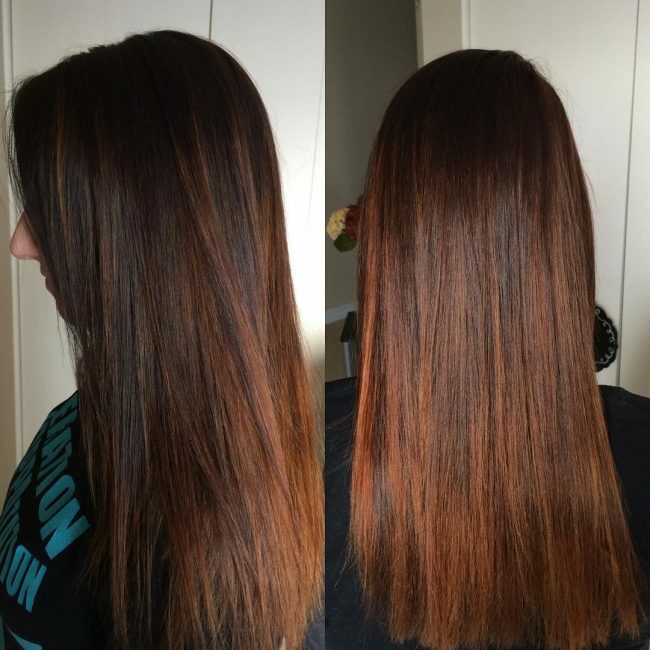 The caramel streaks also help to give them some beautiful color and to finish the look you only have to leave them flowing freely to the back and over your face. 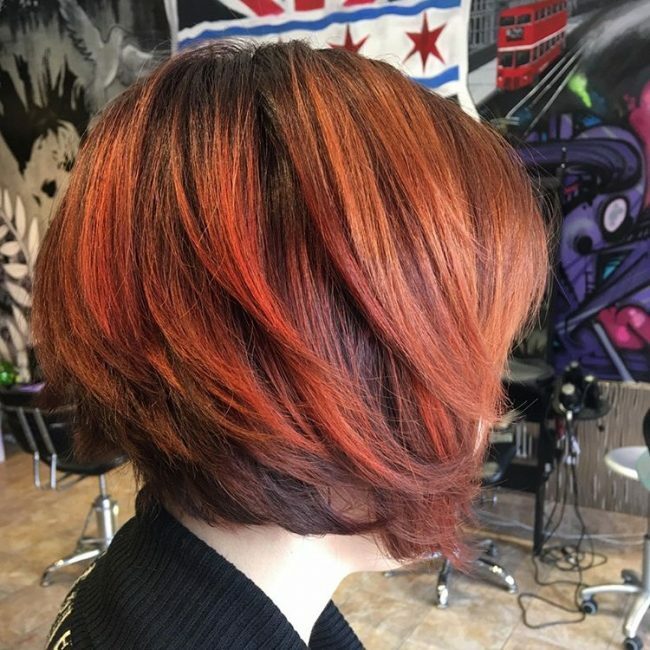 These warm tones will make a woman feel good, and you will want to show them off at any opportunity. The hue comes from blending different shades of light and dark brown, but the caramel is what brings out the warmth. To style them you should create a center part and brush the strands into a face frame. The choppy look in this headdress comes from cutting the locks carefully with scissors to give some texture and some uniform lengths. These strands also have some beautiful waves that appear to come from brushed out curls. 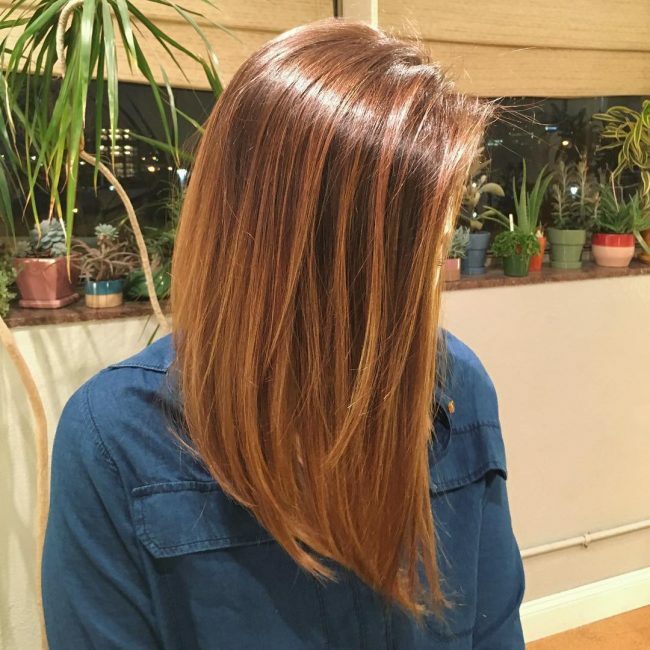 The color is also incredible, and it comes from highlighting the brunette locks with a simple caramel hue. One can never get tired of ombre because there is always something new to try out. 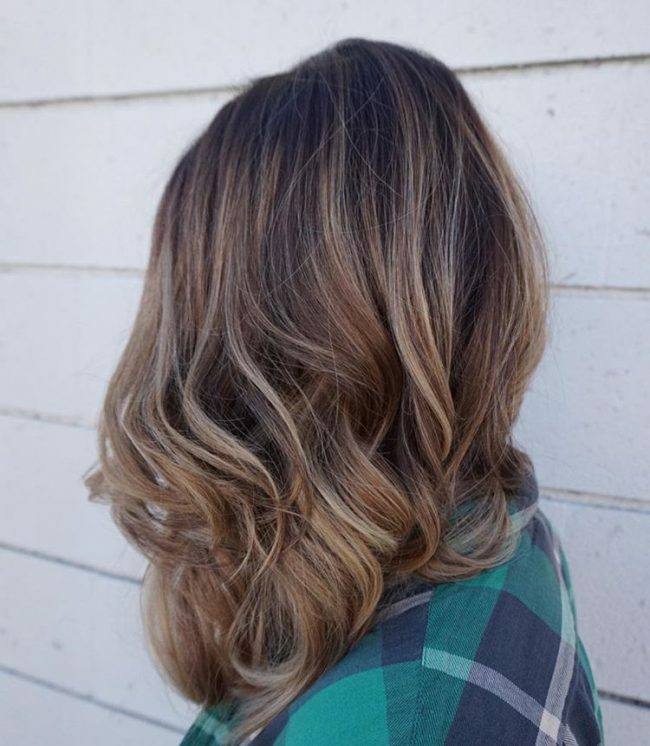 In this particular style, the pattern comes from transitioning from a vibrant black hue to a blend of caramel and blonde. 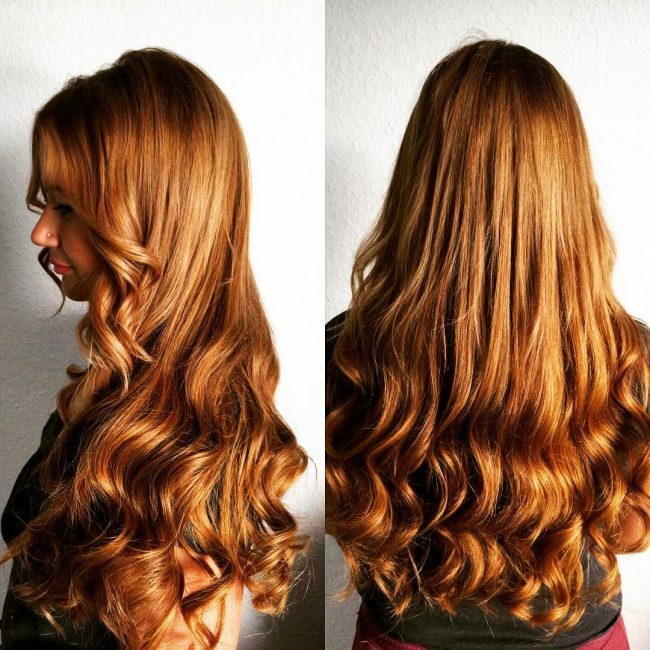 The long textured locks also have some fabulous waves that make them look exquisite. Colors should not make your hair look artificial since you can still get a natural look with the right combination. Here the medium length waves have an amazing style that involves sweeping the strands to the sides. But, the color is what make this a top notch headdress. 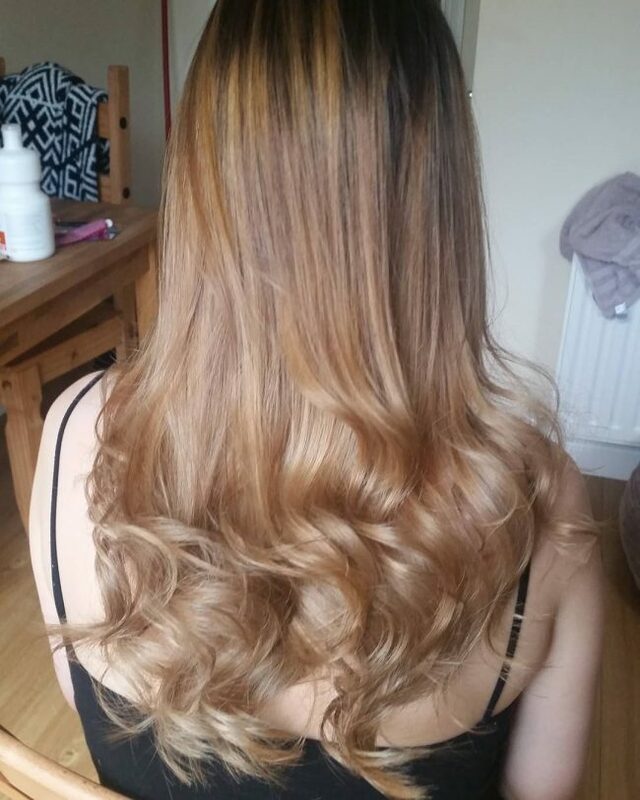 The tone is a pure caramel blonde but with a hint of a golden hue. Jennifer Lopez has an attractive oval face, and she likes to keep some long bangs. In this style, she gives them a light brown shade that is in a lovely Sombre pattern. She also styles them with a center part and by side sweeping to create a face frame that accentuates her face. 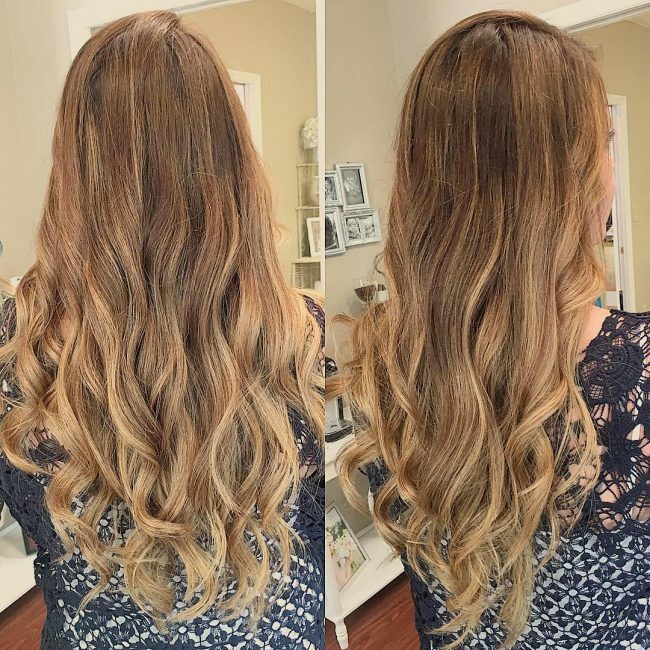 These long locks have a very simple dye job, but they still look fantastic because of the color mix. Natalie Portman is a natural brunette, and in this style, she tries to maintain this look, and all she does is shadow her roots and then finishes with a hint of caramel to give the hair some glow. Julia Robert would look good in any headdress because she has some lovely long blonde locks. And so in most cases she only needs to spice them a little bit to make them trendy. In this style, all that she does is to give them a strawberry blonde hue and a subtle caramel tone to create an adorable look. She then finishes the design with a shallow side part. 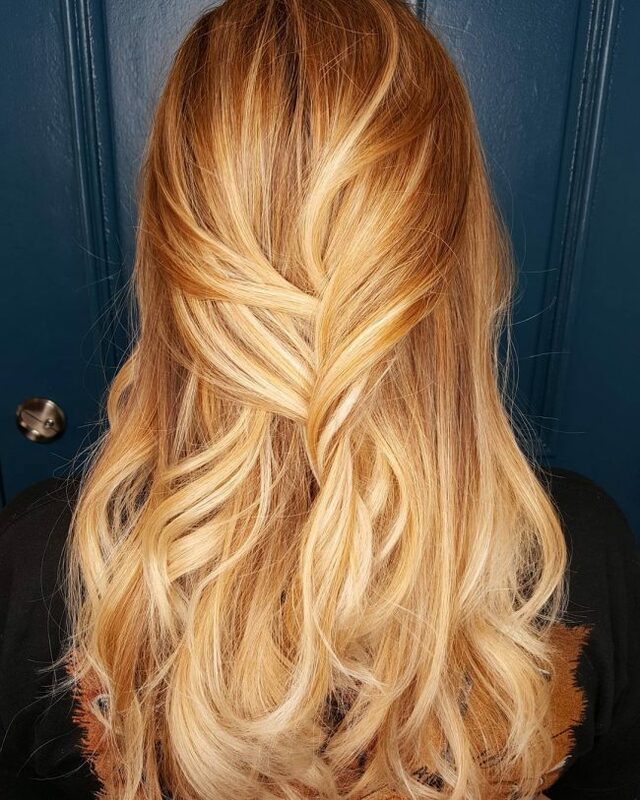 Even a celebrity of Candice's caliber has to keep up with the trend and in this design, she does this with a sweet balayage look. Her balayage headdress is a Sombre design that comes from transitioning gradually from a dark brown base to a soft blonde hue. And she styles it with a simple center part at the front and by brushing back her tresses. The length of Olivia Wilde's tresses in this design and the classic side part is what will catch most people's attention. However, these locks also have an incredible color that makes them look fantastic. 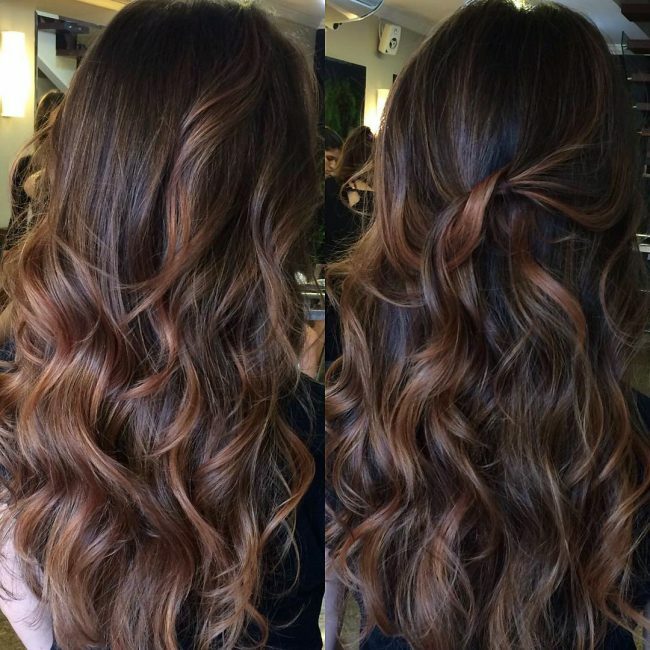 The color is an ombre that involves moving drastically from a chocolate brown base to blend of caramel and light brown. Caramel is one of the few shades that can work for all ladies regardless of their skin tone. It is also a modern and trendy shade if you know how to use it. The advantages of having caramel hair color are endless but the most important thing is to use it right, and this should not be a problem with above 60 hairdos in mind.